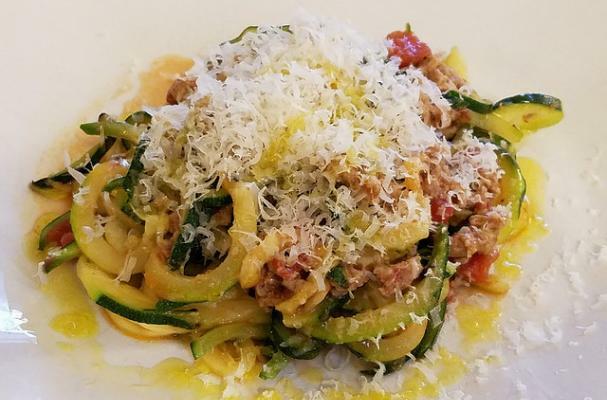 All you need to make this easy dinner recipe are three basic ingredients - zucchini, ground turkey, canned tomatoes - plus whatever seasonings and garnishes you'd like. It only takes about 10 minutes to make - start to finish - and it's both delicious and nutritious! First, if you don't have a spiralizer, I highly recommend getting one! Don't waste your money on buying spiralized noodles as the store. If you're cooking for one, this hand-held spiralizer is sufficient, but if you're cooking for more than one, get one like this (with 5 different blades. There's also one with 7) and you'll be cranking out fun vegetable noodles and ribbons faster than you can grate cheese! This recipe is so easy and healthy I hope it becomes part of your weeknight repertoire. Enjoy! Note: if you are not following a low FODMAP diet, feel free to add onions and garlic to this recipe for added flavor. Add a drizzle or two of olive oil to a large and heat on medium-high. Add ground turkey and cook, breaking up the meat with a spatula, until browned, about 3 to 4 minutes. Season to taste with salt, pepper, and Italian herbs. Transfer to a serving bowl and set aside. Add a bit more olive oil to the skillet (if necessary) and toss in the zucchini zoodles. Cook, tossing frequently, until softened, about 3-5 minutes depending on how cooked you'd like them (I like them still a bit tender, which is a cook time of about 3 minutes). Transfer to the serving bowl and gently toss with the tomato meat sauce. Plate and top each serving with freshly grated Parmesan cheese and a drizzle of oil. *Other oils that are wonderful drizzled over to finish this dish are truffle oil, lemon oil, or any non-flavored high-quality olive oil.